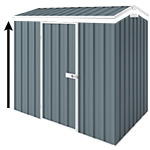 Great size, Australian made Durabuilt garden shed to store all your gardening tools, general equipment or anything that you want to move out from your garage or pack away from your backyard. This storage cabinet features gable roof and double braced hinged doors on the 3.75m side. Double doors can be placed anywhere on the 3.75m side from one wall panel (0.75m) of the corner. The shed is 2.1m high at the gable and 1.8m at the walls. If you want to work in your shed and the 1.8m wall height is not high enough for you, you might want to consider increasing it to 2.1m. You can do that easily by adding the extra height option to your order from the list of accessories below. If you are planning to spend some time in your garden shed doing some handyman job or re-potting etc a louvre window or a fibreglass skylight sheet can be also a good investment to let some natural light into your shed. Good product - difficult to assemble. The items have no codes. it was very difficult to put it together. I asked for installation, i was been told that they don't provide installation. I had to call the manufacturer and they gave me independent contractor to installation. I bought this shed to store garden machinery, and had a limited budget to do so. This was great value, and the detail provided by this site meant I could see and buy exactly what i required.